Stainless steel bearings are specially designed for high humidity working conditions.Important role of the bearings in much equipment makes us think about the solutions for anticorrosion. This solution provides us with long lasting exploitation period. Even construction elements that precise, like plain industry bearings, have small inner clearance, in which the dirt can be found. That’s why it’s important to secure long working period of the bearing, because most of the delays of the equipment are related with bearing maintenance.Bearings made from stainless steel, alloy, and fluoride or with chrome coating are suitable for work in humid conditions. Base of the range is mostly stainless steel bearings,mostly, used in food industry, fishery, chemical processes and for cleaning elements of the semiconductors. NSK suggests solution for this problem - SPACEA and Silver – Lube systems. It is combination of materials, coating and lubricants, which suitable for many industry branches. In SPACEA series, there are lots of various types of bearings, providing different levels of security against corrosion.Bearing balls are made from silicon nitride, separators made from fluoride polymer and water repellent grease or hard lubricant. It increases they durability, working under the water or in water stream up to 5 times. NSK SPACEA™ series ball bearings are optimal for applications in operating environments that are too severe for standard bearings. The SPACEA™ series have a wide array of product variation applicable to special environments such as vacuum, clean, corrosive, high-temperature, dust or water contaminated, and non-magnetic requirements. In demanding operating environments, these bearings will meet your high quality and high performance standards. The SPACEA™ range utilises advanced materials, lubricants and surface treatment technologies for special operating conditions. 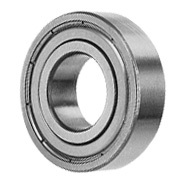 Deep groove ball bearings are the current focus of the rolling element SPACEA™ series. • High temperature applications up to +400 °C. New NSK stainless steel material ES1 provides better corrosion resistance than standard stainless steel SUS440C in a high-hummidity environment. As a result, it contributes towards reducing maintenance, downtime and replacement costs in operation.